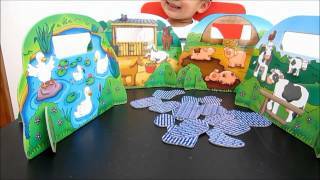 Orchard Toys Game - Farmyard Friends helps younger players in developing their hand eye coordination, while for older players, taking turns to talk about different farm scenes may be enjoyed! In this fun first game, match, sort and post your favourite farmyard friends! Get your children to say aloud the name of the animal as they match the friendly farm animal cards with the correct farmyard picture, posting it through the slot! This game will challenge younger players on concentrating to match the shapes of the animals as there are different animals featured on multiple pictures. This can be played as a single player activity or a multi-player game and is suitable for those ages 2+ and above.